Announcements / I want to join this forum, what do I do? First you'll need to create an account on the forum. You do that by clicking the link below to register a new account. When you click that link, there is a terms & conditions page shown to you. Do not skip over it. It lists typical T&Cs but also includes three questions that you will need to answer via email. When you click past that page you are then asked to select your username and enter your email address and desired password. You are also asked to answer some simple questions about music instruments or math, geography. These steps are used to fight off spam bots that try to auto-register accounts on web forums. Once all that is complete, your account will be created and put into an pending state until you send us an email with answers to the three questions we listed in the registration agreement. Then once we get that email and all looks good, we'll approve the account and you're all set. If any of this is confusing you, just email admin@ep-forum.com and we'll help. I've put up a new logo. Many thanks to new forum member Damian (d-rock) for volunteering his graphics design expertise and giving us a new logo for the forum banner. And now for something different.. an interesting clip I saw today from Japan where a piano tech used springs to improve the repeat action on upright pianos. I don't think the idea of springs is totally new. Some comments on the Youtube clip mention that several makes through the years had utilised something similar. There's also one part of the video where they used a Hitachi jig-saw to drive the repeat test on the keys . Gigs, Events, Music Releases and off topic stuff etc. / Human voice with overtones. This lady must have tines in her larynx.. I got a Mk1 88 stage a couple of years back and have tweaked it here to get it into playable state. I'm very happy with the results at this stage and would think I've got it as far as I probably can. The next project might be a re-tolex. One thing I discovered along the way was that the right-hand wooden harp support block was not side-bolted into the hammer rail. So it was only secured from the frame below. It was in fact leaning about 2mm away from the hammer rail. The screw hole was there both in the block and rail. I had assumed that it may have been removed at some point and just never put back. Ironically when I removed the block from the frame, I uncovered the only date stamp on the entire piano.. "Jun 9 1975". I replaced it with a similar thread to the screw used on the left block. I thought little of it after that. However I recently noticed that the drill holes for the two blocks no longer align with the harp. So when I do go to refix the harp, I'll have to drill new holes. I even loosened the screw again to verify this observation. So it's suggesting to me that it probably left the factory this way. Has anyone ever seen this before. I'm curious to know it this was just a build error or if it was deliberate. It probably ties into some of the recent threads on escapement. Announcements / Rule updates relating to Vendors using this forum..
just wanted to let you know about some new rules we have added in relation to vendors using this forum. We value the contributions of all our members, and want to work with our members that have commercial interests in order to allow them to promote their businesses while continuing to contribute to our community in a meaningful way. We recently decided it would be best to label the accounts of all our members who are in the business of furnishing, servicing, or otherwise selling electric pianos and keyboards. By doing this, we hope to maintain an atmosphere of respectful mutual assistance for all our members. By making it clear when a poster has a commercial interest, we aren't aiming to discount that member's opinion; rather it's a way for all our members to readily identify community contributions of our valuable members who do have commercial interests. Most of the vendors contributing to this forum have gone far above and beyond in helping our members, and we want to honor and respect that in the way we treat vendors that serve our community. The specific changes we made are listed here..
You can see the full set of rules here..
Buying / Paypal... are you out of your mind? As a part of a dispute, paypal orders a buyer to destroy a violin. I'd hate this to happen with a piano! The Fender Rhodes Electric Piano / A look inside Santa's Cave! Its a true Santa Cave of all kinds of classic and new pianos, parts etc. Also some nice footage of the new VV piano harps. Saw this on Google+ yesterday.. just had to share here as I know a lot of you have a running interest in vintage synth equipment. Details from the Youtube description..
Over 20 different NYC female keyboardists playing vintage keyboards at Joe McGinty's Carousel Studio in Brooklyn, NY. An interesting video I found on vimeo.. some guys that have been doing research into using aftertouch to artificially sustain a vibrating tine. It works by means of an actuator positioned under the tine and fed with a sine wave current set at the same frequency of the given tine. The result is a prolonged sustain after striking the note and controlled by an after touch mechanism under the key. Title: The electromagnetically sustained rhodes piano. Authors: Greg Shear and Matthew Wright. Abstract: The Electromagnetically Sustained Rhodes Piano is an augmentation of the original instrument with additional control over the amplitude envelope of individual notes. This includes slow attacks and infinite sustain while preserving the familiar spectral qualities of this classic electromechanical piano. These additional parameters are controlled with aftertouch on the existing keyboard, extending standard piano technique. Two sustain methods were investigated, driving the actuator first with a pure sine wave, and second with the output signal of the sensor. A special isolation method effectively decouples the sensors from the actuators and tames unruly feedback in the high-gain signal path. I was messing around a couple of nights ago to create ringtones for my phone. I've attached some examples. They need to be short and sweet really to be effective. With modern smart phones doing more and more, it can sometimes be handy to have separate alert tones for email, IM, SMS etc. I recorded direct from the harp through an MXR M80 Bass DI (for preamp and EQ) and then through my mixer to Reaper on OSX via a cheap behringer UCA202. Added tremolo and reverb via reaper. The Phaser one was done via my Lexlcon MX-200 using a phaser/chorus combination I concocted to get a decent sounding phase effect. Just an idea in case anyone else wants to share their creations! Good news for those on this side of the pond. ..and wondered.. right lads... either you got one for yourselves.. got one to service/replair or maybe you're going to be a reseller.. and then I saw this on their website..
We import the new VVP rhodes based piano. Anybody know the pricing?... hopefully they won't use Steve Jobs currency conversion where $1 becomes €1. Could be a custom job, but they just uploaded a video showing a piano bass fitted with a valve preamp. Sweet. The Fender Rhodes Electric Piano / Mark II on stage at the Euorvision..
Jan Delay performing on stage before voting begins. A wah pedal in use also. Just lovely... style is returning to this competition! The Wurlitzer Electric Piano / And there was a board for Wurlis! Quite an entertaining set of videos. Is this a case of vintagevibe meets the "dude you're getting a Dell" Guy? Some members have difficulties getting to grips with the use of images and posts. I'll try here to explain how to do this. The main recommendation is to use an account from Flickr, Google Photos, Photobucket etc. All these services allow you to create an account and upload photos. Most will also allow you obtain a web link to an uploaded photo which can then be used on your posts. ..you can also just select the pasted link and click the Insert Image button on the formatting toolbar (2nd button from left, bottom row shows a picture in a frame). Alternatively, you can just click that button and it will paste in the correct IMG delimiters and then you paste your link in between the delimiters. Another option is to just attach your image to your post.... click the "Additional Options" on the bottom left when composing your post and there you will find an Attach option. It would be preferred that you resize your photograph before doing this. There is no need to be attaching full size images. Sizes in the 640 or 800 pixel widths are most appropriate in this forum setting. While the attachment option works, it will put the image at the end of your post. Sometimes its just better to use the linking method as it allows you post each image link in turn as you describe your post. If you need assistance, just contact myself via PM or email admin@ep-forum.com and I'll lend a hand. 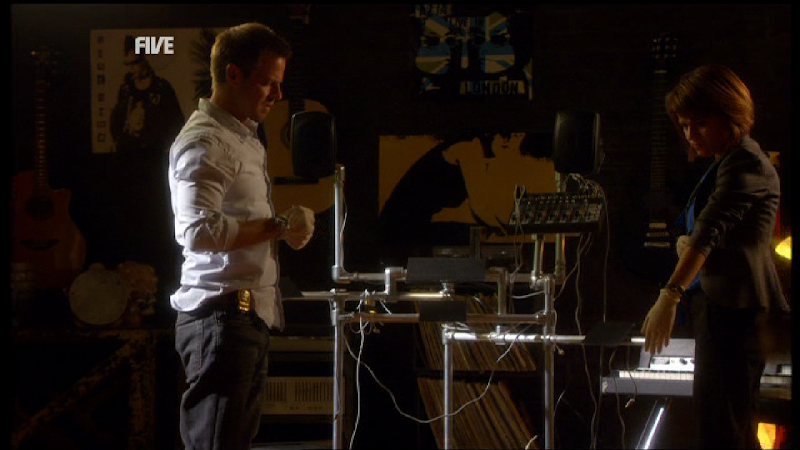 The Fender Rhodes Electric Piano / Even CSI NY can't get the cover behind the front rail! 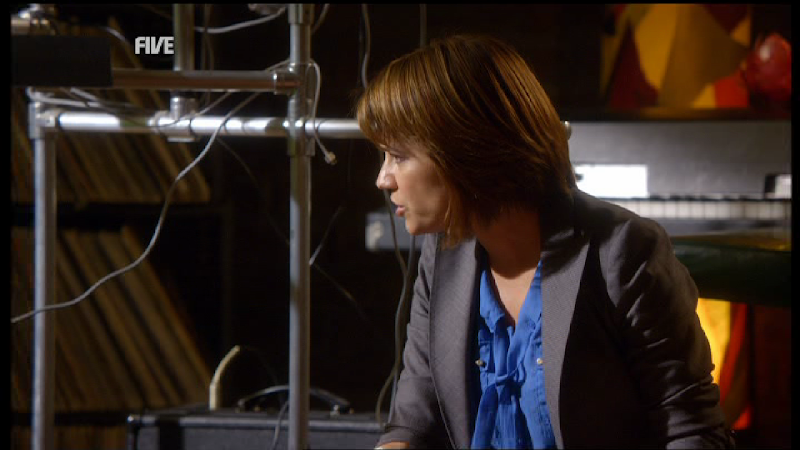 CSI NY Season 7, Episode 2 "Unfriendly Chat". Just aired tonight on Five UK. We get that on satellite in Ireland. The crew were investigating the scene of a murdered musician.. clearly one with taste, as she owned a Rhodes but I digress... yet again the prop people put the cover over the front rail! Forgive them Harold, they know not what they do! I'm beginning to think that the prop people are referring to footage from other TV programs/movies and just replicating the same mistake over and over! Just saw this now when trying to snoop around for NAMM 2011 clips.. has some nice demos of Piano, Rhodes and Wurly sounds. ..looks interesting. Will be cool to hear how it stands up against the Nord in terms of sample quality etc. Apparently they are using an internal SSD to provide of GB's of sample space. FAQ / Welcome to The Electric Piano Forum! my name is Cormac Long and I'm the new host for this forum on the Fender Rhodes. I'm Irish, based in Ireland and own and play a Rhodes piano. I'm not a tech and have absolutely no commercial interests with regards to this forum. I bought a 1974 Mark 1 SP 88 in August 2010 and have been restoring it bit by bit since then. Its a slow and painful process. I'm learning lots as I go. I'm sure it will take forever, will never play as well as the works of art that several of the pros have produced. But this is what you do on a budget!. As it turns out, it will only ever be used at home. I'm not a professional musician. Just someone that lacks a lot of practice and plays a bit at home. I found the Rhodes Super Site forum to be pure gold in terms of a reference on all things Rhodes, especially the tips on restoration. When I found out that James Garfield was looking for a new forum host , I thought I could help. I have previous experience hosting forums. I already have the hosting space for other projects I run. So honestly, its no big deal to do this. I'm getting as much if not more back as I'm putting in. So with the permission of James, I migrated the phpBB forum archives into this forum. This forum is based on Simple Machines Forum, otherwise known as SMF. Its software I've used before in other jobs, so its what I know. It very conveniently provided an import utility to convert the phpBB database contents into its own format. It transferred all posts, user accounts etc. So the wealth of information is preserved. We did do some cleanup.. all accounts that never posted were deleted (over 2000 of them). Lots of spam posts were deleted. There are probably more still lurking there in the archives. The registration process is still moderator approved. I've also modified the registration agreement, asking that new members email myself with some answers to fairly simple questions as a means of rooting out the bots! without that email, all registrations are deleted within 24 hours. I also agreed with James and assure you now that I will not abuse this privilege. Your email addresses are sacred to me and will NEVER be shared with 3rd parties. I will also NEVER send you adverts or any sponsored rubbish etc. Also onboard as a moderator is musician extraordinaire, "Rob A", aka volvoxburger. Rob has been an immense help to me behind the scenes over initial weeks as I was preparing this forum. He has also been assisting in cleaning up remaining spam in the archives and moving valid threads back into the main boards. So thats it for now.. sit back and enjoy this forum! first post here.. hello from Ireland! I recently acquired a Mark 1 88 branded as a Fender-Rhodes. It lacks the serial sticker/stamp and digits on the top & bottom right of the harp. The "Fender-Rhodes", Mark1 and curve-top format suggests a '69-'75 timeline based on my understanding of info I've read here etc. The sustain/damper rail pivot pins are held in place on either side with a square bracket that is screwed onto the plate, with 2 screws. Also the centre of the rail has a bar and long screw securing it to the body below. I mention this as these designs seemed to vary over time and be of importance. While the top of the harp has no markings at all, on the underside of the harp are 3 digits "242". Going on the variable harp dating mechanisms, this as a short-form, might be week 2 or 74, day 2 of the week. But the question really.. has anyone else ever encountered one like this with no markings whatsoever and if the under-side numbering is of any use? You can see this 3-digit numbering here..
That link can let you see other images etc. I have a lot of work ahead to restore this baby but I'm looking forward to it TBH.